This is the tent we have been waiting for! Lightweight, manageable and transportable like the 4m, but with extra space like the 5m, the 4.5m diameter bell tent is the perfect size for a couple wanting a little extra luxurious space or a family wanting a versatile tent. Our Ultimate Pro model has been designed for the ‘professional’ user or those aiming to use their tents for longer spells. 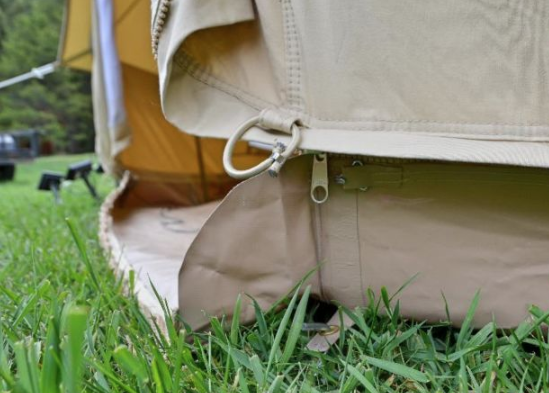 They have a heavier weight canvas and groundsheet– a Canvas wall that can be rolled up. It has heavier pegs and guy ropes than the Ultimate model. It is made out of highly mould resistant cotton canvas. The canvas, despite being mould treated continues to be breathable and super malleable, making the set up super easy and meaning that any creases in the canvas drop out very quickly. In short, these are the most comfortable, durable and mould resistant Bell tents on the market! Lightly treated canvas for water, UV, and mold resistance for maximum breathability. Heavy duty PVC bath tub style ground sheet attached to the tent with a zipper. Groundsheet PVC weighs 650 g/m² (i.e. 1.5 lbs/ 10 ft²). (Zip off ground sheet enables the ground sheet to be unzipped and sides rolled up during the day. 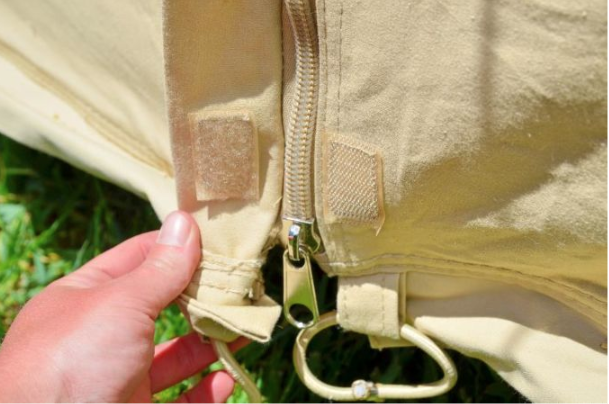 The zip facilitates the re-attachment of the ground sheet and has a protective cover which ensure rain water will not enter between the ground sheet and the tent. This is much harder to achieve with a separate ground sheet). Spring loaded heavy duty central pole – clicks together easily during assembly.